StarOffice 8 is a full-featured office suite that contains a word processor, a spreadsheet tool, applications for presentations, databases, math formulas and drawing. It has support for most Microsoft Office formats (except for the formats introduced in Office 2007), but it can also export documents as PDF out of the box. The software normally costs $70, but it's available for free in Google Pack. It's worth noting that StarOffice has a huge installer (more than 140 MB), so you should download it only if you have a fast Internet connection. It will be interesting to see why Google didn't choose to include OpenOffice.org, the primary difference between StarOffice and OpenOffice.org being that StarOffice includes some proprietary components like clip-art graphics, fonts, templates and tools for Microsoft Office migration. The next step would probably be the addition of a plug-in that lets you synchronize local documents with Google Docs & Spreadsheets, so you can have the best of the both worlds: edit complicated documents offline, collaborate and store files securely online. For now, StarOffice is integrated with Google Search and Google Desktop. I to was wondering why OpenOffice.Org was not included. Star Office with a cost of $70 on there website, but with Google Pack is free?? Seems like we are missing something. Yes, the version of StarOffice included in Google Pack is free. It's interesting that GOOG and Sun signed a software distribution agreement in 2005. "Under the agreement, Sun will include the Google Toolbar as an option in its consumer downloads of the Java Runtime Environment on http://java.com. In addition, the companies have agreed to explore opportunities to promote and enhance Sun technologies, like the Java Runtime Environment and the OpenOffice.org productivity suite available at http://www.openoffice.org. " For some reason I don't have StarOffice in the list I get after loading http://pack.google.com. No sign for this from any Google or Sun source either. Google Pack gives you StarOffice for free? That's nice. You just need to register and you can get your free copy of StarOffice 8 (the Windows version has 270.78 MB). I guess Google and Sun are actively doing business together. If you have OpenOffice.org without many addons, you can get templates by just converting your Microsoft Office templates, then pointing to them. To add them to the gallery, follow these instructions. Google and Sun have a very close relationship, you just have to look at Google's CEO. From Wikipedia: "He led the development of Java, Sun's platform-independent programming technology, and defined Sun's Internet software strategy. He later became chief technology officer and corporate executive officer." I wonder when Google Earth will join Google Pack - it's making the Google Pack picture redundant (if you look at it, it's running GEarth). But does StarOffice load fast enough ? Last time I checked, OpenOffice took more than 5 mins to load on a linux system (FC2). Does StarOffice on Windows load & update as fast as MS Office ? ��� Try uninstalling your Google Updater, then reloading pack.google.com. The tip about uninstalling Updater is for the person that wrote, "For some reason I don't have StarOffice in the list I get after loading http://pack.google.com." I am bit surprised that such propritary package being given out free. Then somebody also mentioned that "we are missing something". Are we really missing out something? Google says the StarOffice installer has "up to 210MB, depending on your language". Probably the version from Sun includes the translations for all the supported languages, while the Google Pack version only includes a single language, based on your IP, browser settings, etc. "OxygenOffice Professional (was: OpenOffice.org Premium) is an enhanced version of OpenOffice.org [that] contains more extras like templates, cliparts, samples, fonts and VBA support." "More than 3,200 graphics are included, both clip art and photos. These pictures are integrated into the gallery and can easily be placed into any OxygenOffice document. Several templates and sample documents are included, as well as over 90 fonts." OxygenOffice Professional is based on OpenOffice.org 2.1 and it's free. Excellent addition! I first used Star Office back in the year 2000, and have always had the highest respect for it. Been using OpenOffice.org since (I think) 2002, but the extra usability of Star Office is very welcome... Well done, Google! Google is really trying to gain more friends on the desktop space. With Microsoft, being very upfront about doing everything to beat Google, having a stronghold in this space (desktop), this is only a logical (and necessary) move. And with their online office efforts on a full throttle now, this is a very promising start of an integration between Staroffice (or openoffice) and Docs and Spreadsheets. Requarding the loading speed, That was one of my pet peeves, However I found this post and it made a world of difference. I you openoffice on Ubuntu, i would think it would work on Win as well. I've downloaded and installed StarOffice, and gave it a try. Most of the "new" features are useful for businesses or for a better compatibility with MS Office. Cool, google's essentials pack is getting better and better all the time. I can recommend this to anynone. Someone should make an iso that people can give out their friends and families for xmas. What are the differences between StarOffice 8 software and the OpenOffice.org 2.0? * Mail Merge Wizard does not have the ability to send mail merge documents as emails. OpenOffice first load in 7-8 seconds on an FC7 Linux AMD 3200 on X86_64; second load several seconds. And Linux is left out in the cold again. How come? OpenOffice is included in a lot of Linux distributions (Ubuntu, SuSE, Red Hat and others). This is an excellent thing, because this allows a nontechnical user who hasn't purchased a copy of Office to have access to a decent word processor, spreadsheet, and database, so the user can exchange documents with others. That's a good point, Scott. I know someone who installed Google Pack in Windows 2000 bypassing the verification and it worked pretty well. In fact, all the software included in Google Pack should work in Windows 2000. So the explanation might be that the updater software included in Google Pack uses some features that aren't available in Windows 2000. Regarding other operating systems, I'm sure Google will provide an option at some point. Maybe they wait until most of their software* works in Mac and Linux. That is an interesting point about "other" operating systems. While I know that a majority of people use a windows based computer, Linux/BSD/Mac are becoming more avaiable. I for one have changed my laptop to 100% Ubuntu, working on building a new desktop that I will use 100% Ubuntu on. Funny thing about Google is from what I have read a majority, dare i say 80%+ cant find the article right now, uses a flavor of Ubuntu, dubd Goobuntu. I'm utterly confused by this. Who is the addition of StarOffice aimed at? We all use one Office type suite or another (personally I use OpenOffice) but I'm just a little confused at who Google thinks will benefit from this addition. Surely, those people who are committed to MS Office are not going to suddenly switch. And those that aren't would already be aware of StarOffice. Instead of trying to find the software online, downloading it, installing it and making sure it's up-to-date, Google Pack can take care of this for you. So it's more like a package targeted to people that aren't too tech-savvy, but want more than Microsoft Windows offers out of the box. I seem to remember that an old Sun motto was "The server isn't the network rather the network is the server." Seems to fit nicely with google and it's online offerings. I don't really complaint, I actually think it is probably a good idea for the "migration pack" and it uses ODF which is good. "But does StarOffice load fast enough ? Last time I checked, OpenOffice took more than 5 mins to load on a linux system (FC2)." I just tested the load times on a three year old 2.8 GHZ Pentium 4 with 512 meg of RAM using kernel 2.6.18, xorg 6.9.0 and OpenOffice 2.2.0. Initial loadtime after boot: 20 seconds. It is really nice that StarOffice is offered free by the Google Packs. This may help in the adoption of ODF as the document format. But does StarOffice load fast enough ? Last time I checked, OpenOffice took more than 5 mins to load on a linux system (FC2)." I too faced similar problems on FC 2 with OpenOffice 1.5 few years ago. Upgrading memory to 512 MB helped. Upgrading OpenOffice.org to version 2 also fixed the problem. Fedora Core 2 and OpenOffice.org are ancient now. On my FC 6 box OpenOffice.org loads instantly. I don't know just exactly what Google is up to; but, I agree that this does conflict with the fast download/install statement. However, the ability to download just the apps you want will somewhat compensate for the heavier load. The addition of StarOffice instead of OpenOffice appears to be a strange choice but so was the ousting of Ad-Adware for Spyware Doctor. Some reviews this year have not been favorable. One of CNET's reviews being one of them. Sorry I'm kind of ignorant to the following statement. Is this saying that any document that is created in Office 2007 will not be able to be read or altered with the StarOffice? Thank you for your help. "It has support for most Microsoft Office formats (except for the formats introduced in Office 2007"
In response to the question about "It has support for most Microsoft Office formats (except for the formats introduced in Office 2007"
Short answer: Just about every office suite can process .doc/.xls files now. So Microsoft decided to "fix" that - Office 2007 makes files that aren't .doc or .xls anymore, unless you tell it otherwise. Long version: Microsoft Office 2007 defaults to saving new files in a file format Microsoft calls "Open XML", which, despite the name, can't be implemented legally in some countries because the Open XML standard references other Microsoft standards that Microsoft has patented. It is, of course, completely different than .doc format. There is an "optional" download for Office 2000/XP/2003 to read and write Open XML. Office 97 and earlier, and people with just WordPad, and, of course, non-Microsoft products (like OpenOffice and StarOffice), are unable to use these new files-- shame on you if you haven't paid Microsoft lately. 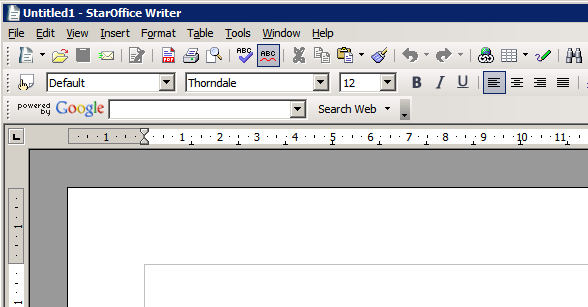 Office 2007 can read and write in .doc/.xls/etc. format - but you have to go into the options and change them for it to default that way. Otherwise, you'll be kindly helping Microsoft "encourage" your friends to upgrade to Office 2007 every time you send them something. All of this is technically unrelated to (but a Microsoft attempt to confound) the OASIS OpenDocument (ODF) standard, which OpenOffice, StarOffice, KOffice, and IBM Workplace all use as their native format now and WordPerfect and Google Docs & Spreadsheets also support. The answer to why StarOffice is free with GooglePack might be "For now, StarOffice is integrated with Google Search and Google Desktop." Which is to say, the search based click thru revenue from Google might be shared back with Sun for those hits originating from StarOffice. The interesting question I have is "how does this fit in with Google docs?" Is it possible that we see tighter integration between the two? StarOffice opening Google Docs directly? I always assumed that Google would work their online suite into working offline through clever caching. But maybe not...? Anything that steals a few more Dollars (or pounds, or whatever other currency they choose) from Microsoft can only be good in my book. Also, I think the google pack is great for those who can't be bothered or don't have the knowledge to install open source/anything not Microsoft software, although it is now exceptionally easy, especially for windows users. 1. Whether this software is used for home / personel computers or can it be used for professional / commercial purpose? 2. Whether this is limited time offer and we have to renew it every year? 3. Whether after some period it will be charged? It is mentioned at the web site its cost is $80. 4. The link that is given at the google web site is connected directly to web site of Star office. Does this indicates that we are suppose to register this software at tar office web site. I have similar question for Norton internet security software. Can anyone from this blog can answer this queries? 1. 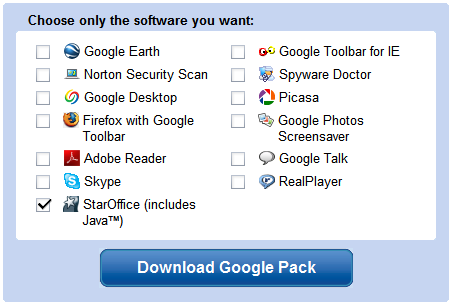 Google Pack (like most Google software) is available for "personal, non-commercial use". 2. The offer isn't time-limited. 3. You get the full version of Star Office, not a trial or a demo. 4. No. Google links to the official site of each product so you can find out more information before downloading it. So... If Star Office is available free, why are people still using OpenOffice? Can anyone give me the details of OxygenOffice that is available free now? 1) Google right now is just offering SOffice for WinXP/Vista. I use Linux, so get to know. 2) Even if SOffice is free as beer, it's not free as freedom of speech but OO.org IS. I had thought OpenOffice.org was able to open Word 2007 files already. NeoOffice, a free and open-source Macintosh office suite based on OpenOffice.org, has had the ability to open .docx files for quite some time (since March or April, I think). And it can now open many Excel and Powerpoint 2007 files as well. One more reason to get a Mac, I guess! Just point me to a "CLICK HERE TO INSTALL LINK" PLEASE!!! Google Pack is Windows-only. Star Office offers versions only for Windows, Linux and Solaris. So there's no way you can get Star Office for Mac. But you can try OpenOffice for Mac. Sorry, I'm going far back in the thread. Quoted text: Who is the addition of StarOffice aimed at? I know exactly who this would appeal to, since I think I'm the target market. I use MS Office at work, since it's there. But when I bought my home laptop, I wasn't interested in actually paying for office, so I stumbled upon OpenOffice. If StarOffice had been available on Google for free at the time, I would have downloaded it instead. But I'm not going to bother uninstalling OpenOffice just to install Star Office. I have an office suite, it works, do why change? Cheap, lazy people like me. That's who it's targeted for. Apropos of nothing, I saw a copy of Lotus Smart Suite for sale at the local cheap computer store for $5. I was tempted. I recently downloaded Google's StarOffice. The following day my I.E. 6.0 was totally frozen. Everything else worked fine. I have XP Professional. Yesterday a friend told me his I.E. (ver ?) quit working. He downloaded Google's StarOffice a few weeks back. He has Win. 2000. Anyone know of this being a problem caused by StarOffice? and what needs to be done to fix this problem when it happens? Thanks....for your input. I use MS Office at work, since it's there. But when I bought my home laptop, I wasn't interested in actually paying for office, so I stumbled upon OpenOffice. I'm not advocating drinking the Microsoft Kool-Aid ... however, you do realize that through Microsoft's "work at home" license, you can install a copy of your work office software on your home PC, right? I sure wouldn't have plunked down the cash for Office '07, but I was able to bring home a copy from work and install it - legally. Has anyone tried to download Star Office 8 under the educational license? Thanks for the Google team. also "Google". Google can use linux system too. So they might reach all over the world every point. Google office I want also. But office program must have Google search face on it. I want to Google Space world universe too. But must install all of the computers at once easly I want all gmail talk defrag backgamon other in Google OS . Surround my life Google as soon as possible pls. My name is Bahadir Hamamcioglu. I live in Turkey İstanbul. Come reach us help us with your name Google pls smile us. Can Star Office sync with PDA and Phone running windows mobile? The Google version of StarOffice includes an annoying Google toolbar, which can't be permanently disabled. This will be the reason for not using OpenOffice, because the toolbar would not be allowed by the OpenOffice license agreement without publishing its sourcecode. I'm sure the source code for adding a simple search box is extremely complicated. Can any one tell me WHERE Google Updater stores the Star Office files? I wasn't able to dig them out! Do I need to every time I want to install it on my 7 pcs to download it or mI might to copy it from the area on the disk it is stored in to? That pisses me really off! You can download Star Office from Google without installing Google Pack: here's a link to the current version (English). Copy the file to a different folder. Nice program, and its free. thanks sun and google. I would like to try this software first. Is Google Pack available on CD? I downloaded google pack yesterday All software were downloaded except star office which is the only software required by me. Since this is pack, can I download star office alone, and what are all the requirements for star office download since an error is shown at the time of installation after partial download? StarOffice was recommended to me as being more compatible with different formats. I receive work-related MS-Office files, and needed to guarantee interoperability at least with those. Thanks to the user to pointed directly to the installer file - I'm dropping it on a CD for a non-'net friend of mine. And btw, I'm using Windows Vista, but have also installed SO on Win-XP Pro without a hitch. After trying 4 times over 2 days, to unsuccessfully get StarOffice to download, I gave up. Where is google os? When you search a picture in your OS search when you find your answer an OS can sent it where you want it. Desktop or mydocuments printer or any program that you work on a subject.So dont want to use copy, cut and paste function. Noname but I have a best wishes to done in your operating lab. I don't really want to have two programmes open office and star office taking up space. Especially since my laptop was bundled with Microsoft Works, what two should I get rid off? I'd get rid of windows, get Mandriva, and use OpenOffice, loads fast and works great. Compatibility forget about it. I don't think there is an office software as versatile. Somebody had mentioned that you cannot permanently disable to toolbar. That is incorrect, you can actually remove it completely. Select toolbar and press Remove. How can I find the downloaded StarOffice file on my harddisk? The application canno be started. The user interface language cannot be determined. Any clue to help me, allready uninstalled and reeinstlled 3 times, same result. Check this page. You can uninstall the program from Google Updater or directly from "Add/remove programs" in Windows. Star Office seems to have disappeared now know anything? Star Office does not appear any more - not sure why? HELP! Where's star office gone? Bring it back. Very sad about that. I was using it till a system reinstall-now I'm back to OO and it has way too many problems. Why does star office 8 calc or writer keeps converting my currently saved document to nonsense language and when I click on a calc document it opens a text imports window instantly. If I click okay everything in the file is lost? Help ASAP. end of month is billing time. I am sincerely confused, I went to the Google page to download the Google Pack, which was supposed to list StarOffice with it, the page that lists the programs to be downloaded make absolutely NO Mention of StarOffice software at all. I also encounter the same problem when I tried to download the google pack with the StarOffice... It is not there. It's great. I think, it's moving good to best. Google, the #1 and will remain same all the time I pray to God. Having read all of the comments above, I have trouble understanding all the anger/hatred regarding Microsoft. Yes, it is a huge company and has made some people very rich but that is no reason to spew venom all over the place. Much can be said for Google and a few other Silicon Valley companies. Free vs. cost or Linux vs. Vista are not valid reason either. Make your own personal choice and even try to influence others but cut the crap in doing so! Does Google StarOffice 8 be open in any computer? Is it possible for google to add more software in the google pack? I agree that google pack should have more software inside. I would really really really love to have this connector. I'm giving my life up to the google cloud. @ Solveig Haugland: If you have OpenOffice.org without many addons, you can get templates by just converting your Microsoft Office templates, then pointing to them. http://openoffice.blogs.com/openoffice/2007/01/openoffice_temp.html ---YAH..I TRIED THIS ONE..Thanks!!! Well Done. Please, Also Make developer tools open source like visual studio to create and used android mobile application and also some web based and console based application. Do it soon good bye. Can anyone tell me IF StarOffice 7 works with Internet Explorer 9? Graphic design is nice and it's not hard to find anything you want to. The ads are not annoying, the design and functionality is good as described above, so I can give five stars to this site. I just downloaded startoffice. I will try to use it. Thank you.